Cozy cabane en bois rond, situé à distance de marche de la rivière Battenkill. Très proche des centres commerciaux, la pêche, le canoë et le kayak. Près des stations de ski. Vue imprenable: Cette propriété étonnante Vermont offre une vue spectaculaire sur les montagnes et entoure toute l'année et peut être vu depuis le balcon terrasse ou dans la cour. Une vue imprenable sur Vermont feuillage d'automne. Pour la méthode la plus rapide de la communication, s'il vous plaît appelez gestionnaire immobilier au 802. 236. 2029. Les salles de bain sont chambres extérieures à l'usage par tous dans la cabine. Serviettes et draps fournis. Les animaux domestiques sont les bienvenus et vont adorer la cour géante! This property has the perfect balance of rustic log cabin style and modern home conveniences in a quiet setting away from it all but close enough for quick trips to Manchester, Bennington or the ski resorts. 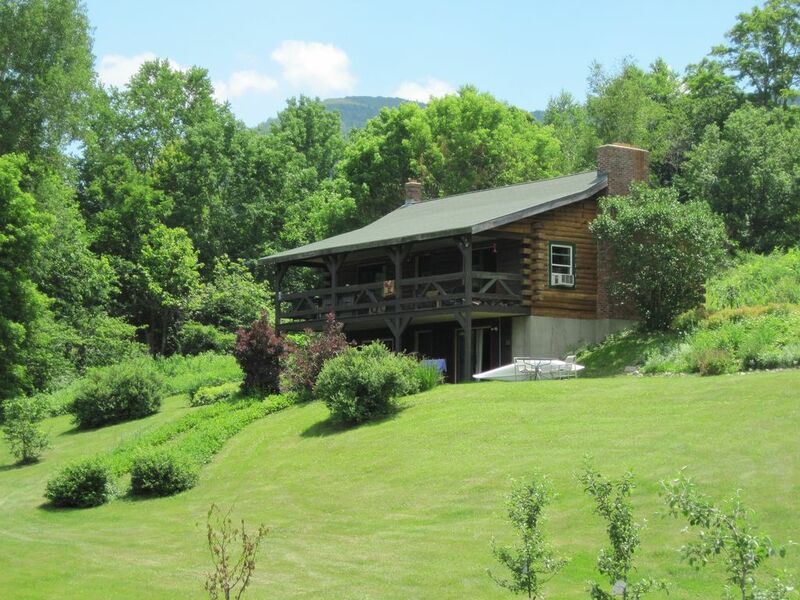 Comfortable cozy great room with wood burning fireplaces and comfy couches, fully equipped kitchen, lots of woods and open fields in the gentle Battenkill River valley between the Green Mountains. Highly recommend this as a place to unplug or as a home base for activities in the area. Very glad that you were able to enjoy the cabin and nearby surroundings! We hope you come back and stay soon! We stayed 3 nights and enjoyed every day. Beautiful and secluded property. Great place if you have kids and want them to run around or just want a peaceful spot to relax. The house is simple, but comfortable. Just a few minute drive into Arlington and about 15 minutes into Manchester for restaurants and shopping, trails and more. We would like to return at some point. So glad that you got to enjoy all that Manchester and Arlington (and nature!) has to offer. Please come back and stay again soon. My husband and I enjoyed 10 days in this lovely cabin. It was well equipped with all that was needed to make this our home away from home. The setting is so very pretty and peaceful. We were able to comfortably accommodate some additional family members who came to stay for a couple of days. Great proximity to good restaurants, biking, and hiking. We were hoping for better fishing, but that was a seasonal downfall, i.e. low river, so we'll have to come back for another try! Thank you for your review, we always enjoy hearing what others loved best about the cabin. Hopefully next time you stay there will be better fishing! My husband and I rented this home for a month this summer. The cabin had everything that we needed and was secluded yet not too far from the city of Manchester. We felt like we were alone in nature, yet we could get to many restaurants and shopping with only a 20 minute drive. The Equinox Preserve with many miles of trails was a highlight. At the home, we grilled out most nights and spent hours on the back porch watching the sunset. We saw turkeys and deer from the house. We also loved walking and biking along River Road, a secluded gravel road that runs about three miles in front of the house alongside of the Battenkill river. At one end of the road is a small inn with live bluegrass on Wednesday nights and a great outdoor pizza oven. Overall, we had a great experience and would recommend this place to others. We are so glad you enjoyed the cabin and so much of what the area of Arlington and Manchester has to offer! Come back soon! Stayed in this cabin primarily for the fall colors. However, I am a fly fisherman and appreciated the proximity to the Battenkill and other local streams and the flagship Orris store is only a 15 min drive. The property is well cared for, the owner and caretaker very responsive and (very important to me) the main level bed was quite comfortable...slept like a baby for the 9 nights I was there. Fires in the fireplace insert kept the cabin toasty warm. The views from the rear deck are amazing and the lack of ambient light provided incredible night skies. Its just far enough away from town to feel like your away from it all, yet close enough that anything you need is only a short drive away. Be sure to check out the North Shire Bookstore and coffee shop...its a treat!! I highly recommend this cabin for your next escape. We are glad to hear you had a great stay. Please come back for more fly fishing and foliage next year! My husband and I stayed in this lovely cabin with our 20 year old son who was taking a weekend break from hiking the Appalachian Trail. It was a perfect weekend for all of us. The cabin had everything we needed and was clean and well-maintained. Breathtaking views from the deck, comfortable accommodations inside, combined with the peaceful quiet of a private setting made it incredibly hard to leave. We had planned to take advantage of the many outdoor activities nearby but only managed to tear ourselves away from the cabin for a great hike up nearby Equinox Mountain. Thanks to both the owner and manager who provided us with all we needed for a wonderful stay! We are happy to hear you enjoyed your stay so much! Come back soon and good luck to your son on hiking the AT! For stays of 3 or more nights, the nightly rate is $225.00 Rates listed above do not apply to holidays. Please call for holiday rate information.